The muscles acting on the foot can be divided into two distinct groups; extrinsic and intrinsic muscles. The extrinsic muscles arise from the anterior, posterior and lateral compartments of the leg. They are mainly responsible for actions such as eversion, inversion, plantarflexion and dorsiflexion of the foot. The intrinsic muscles are located within the foot and are responsible for the fine motor actions of the foot, for example movement of individual digits. In this article we shall be considering the anatomy of the intrinsic muscles of the foot. They can be divided into those situated on the dorsum of the foot, and those in the sole of the foot. 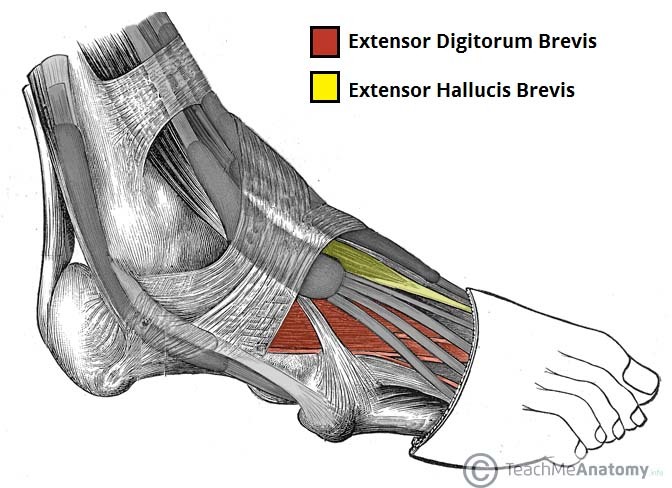 Whilst many of the extrinsic muscles attach to the dorsum of the foot, there are only two intrinsic muscles located in this compartment – the extensor digitorum brevis, and the extensor hallucis brevis. They are mainly responsible for assisting some of the extrinsic muscles in their actions. Both muscles are innervated by the deep fibular nerve. The extensor digitorum brevis muscle lies deep to the tendon of the extensor digitorum longus. Attachments: Originates from the calcaneus, the interosseous talocalcaneal ligament and the inferior extensor retinaculum. It attaches to the long extensor tendons of the four lateral digits. Actions: Aids the extensor digitorum longus in extending the lateral four toes at the metatarsophalangeal and interphalangeal joints. The extensor hallucis brevis muscle is medial to extensor digitorum longus and lateral to extensor hallucis longus. Attachments: Originates from the calcaneus, the interosseous talocalcaneal ligament and the inferior extensor retinaculum. It attaches to the base of the proximal phalanx of the great toe. Actions: Aids the extensor hallucis longus in extending the great toe at the metatarsophalangeal joint. Fig 1 – The dorsal layer of foot muscles. There are 10 intrinsic muscles located in the sole of the foot. They act collectively to stabilise the arches of the foot, and individually to control movement of the digits. All the muscles are innervated either by the medial plantar nerve or the lateral plantar nerve, which are both branches of the tibial nerve. The muscles of the plantar aspect are described in four layers (superficial to deep). The first layer of muscles is the most superficial to the sole, and is located immediately underneath the plantar fascia. There are three muscles in this layer. The abductor hallucis muscle is located on the medial side of the sole, where it contributes to a small soft tissue bulge. Attachments: Originates from the medial tubercle of the calcaneus, the flexor retinaculum and the plantar aponeurosis. It attaches to the medial base of the proximal phalanx of the great toe. Actions: Abducts and flexes the great toe. Fig 2 – The first layer of plantar muscles. The plantar aponeurosis has been cut to reveal the underlying flexor digitorum. The flexor digitorum brevis muscle is located laterally to the abductor hallucis. It sits in the centre of the sole, sandwiched between the plantar aponeurosis and the tendons of flexor digitorum longus. Attachments: Originates from the medial tubercle of the calcaneus and the plantar aponeurosis. It attaches to the middle phalanges of the lateral four digits. Actions: Flexes the lateral four digits at the proximal interphalangeal joints. 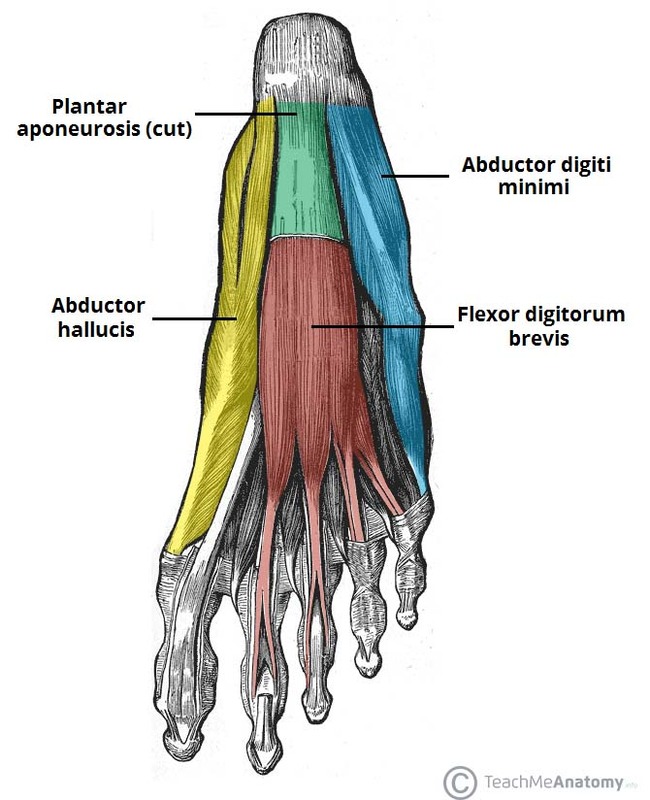 The abductor digiti minimi muscle is located on the lateral side of the foot. It is homologous with the abductor digiti minimi of the hand. Attachments: Originates from the medial and lateral tubercles of the calcaneus and the plantar aponeurosis. It attaches to the lateral base of the proximal phalanx of the 5th digit. Actions: Abducts and flexes the 5th digit. The second layer contains two muscles – the quadratus plantae, and the lumbricals. In addition, the tendons of the flexor digitorum longus (an extrinsic muscle of the foot) pass through this layer. Fig 3 – The second layer of the plantar muscles. 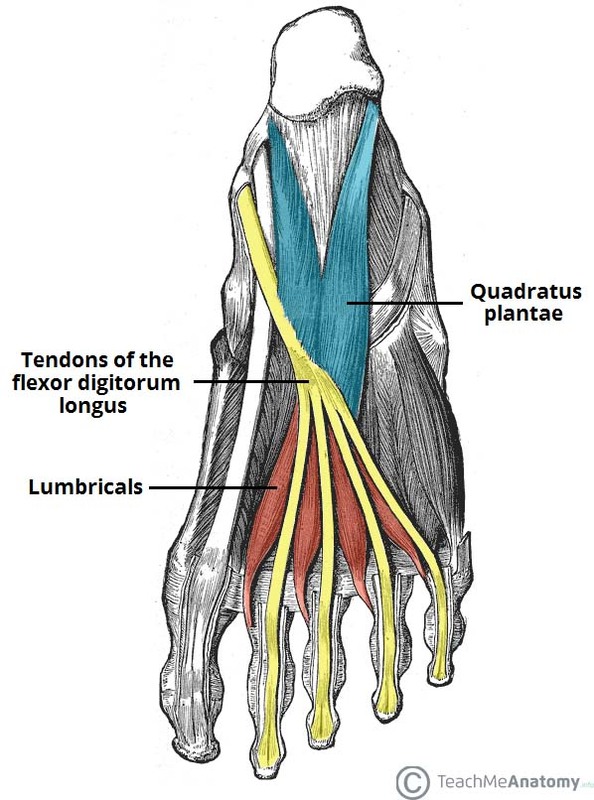 The quadratus plantae muscle is located superior to the flexor digitorum longus tendons. It is separated from the first layer of muscles by the lateral plantar vessels and nerve. Attachments: Originates from the medial and lateral plantar surface of the calcaneus. It attaches to the tendons of flexor digitorum longus. Actions: Assists flexor digitorum longus in flexing the lateral four digits. There are four lumbrical muscles in the foot. They are each located medial to their respective tendon of the flexor digitorum longus. Attachments: Originates from the tendons of flexor digitorum longus. Attaches to the extensor hoods of the lateral four digits. Actions: Flexes at the metatarsophalangeal joints, while extending the interphalangeal joints. Innervation: The most medial lumbrical is innervated by the medial plantar nerve. The remaining three are innervated by the lateral plantar nerve. The third layer contains three muscles. 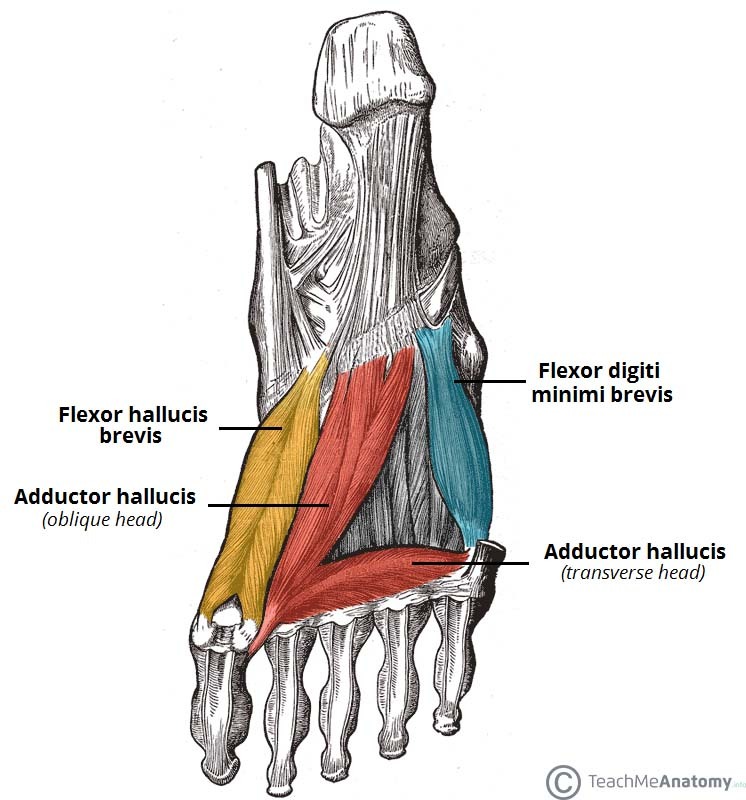 The flexor hallucis brevis and adductor hallucis are associated with movements of the great toe. The remaining muscle, the flexor digiti minimi brevis, moves the little toe. The flexor hallucis brevis muscle is located on the medial side of the foot. It originates from two places on the sole of the foot. Attachments: Originates from the plantar surfaces of the cuboid and lateral cuneiforms, and from the tendon of the posterior tibialis tendon. Attaches to the base of the proximal phalanx of the great toe. Actions: Flexes the proximal phalanx of the great toe at the metatarsophalangeal joint. Fig 4 – The third layer of plantar muscles. The adductor hallucis muscle is located laterally to the flexor hallucis brevis. It consists of an oblique and transverse head. Attachments: The oblique head originates from the bases of the 2nd, 3rd and 4th metatarsals. The transverse head originates from the plantar ligaments of the metatarsophalangeal joints. Both heads attach to the lateral base of the proximal phalanx of the great toe. Actions: Adduct the great toe. Assists in forming the transverse arch of the foot. Innervation: Deep branch of lateral plantar nerve. The flexor digiti minimi brevis muscle is located on the lateral side of the foot, underneath the metatarsal of the little toe. It resembles the interossei in structure. Attachments: Originates from the base of the fifth metatarsal. Attaches to the base of the proximal phalanx of the fifth digit. Actions: Flexes the proximal phalanx of the fifth digit. Innervation: Superficial branch of lateral plantar nerve. The plantar and dorsal interossei comprise the fourth and final plantar muscle layer. The plantar interossei have a unipennate morphology, while the dorsal interossei are bipennate. There are three plantar interossei, which are located between the metatarsals. Each arises from a single metatarsal. Attachments: Originates from the medial side of metatarsals three to five. Attaches to the medial sides of the phalanges of digits three to five. Actions: Adduct digits three to five and flex the metatarsophalangeal joints. There are four dorsal interossei, which are located between the metatarsals. Each arises from two metatarsals. Attachments: Originates from the sides of metatarsals one to five. The first muscle attaches to the medial side of the proximal phalanx of the second digit. The second to fourth interossei attach to the lateral sides of the proximal phalanxes of digits two to four. Actions: Abduct digits two to four and flex the metatarsophalangeal joints. Tearing of the extensor digitorum brevis muscle fibres will result in a haematoma. This produces a characteristic swelling anteromedial to the lateral malleolus – differentiating it from a sprained ankle (for which it is often confused). The medial plantar nerve can become compressed and irritated as it passes deep to the abductor hallucis muscle. This can cause aching, numbness and paraesthesia on the medial side of the sole of the foot. The muscle can become compressed during repetitive eversion of the foot, which may occur in some sports such as gymnastics. Which nerve innervates extensor digitorum brevis and extensor hallucis brevis? Which of the following muscles is innervated by the lateral plantar nerve? 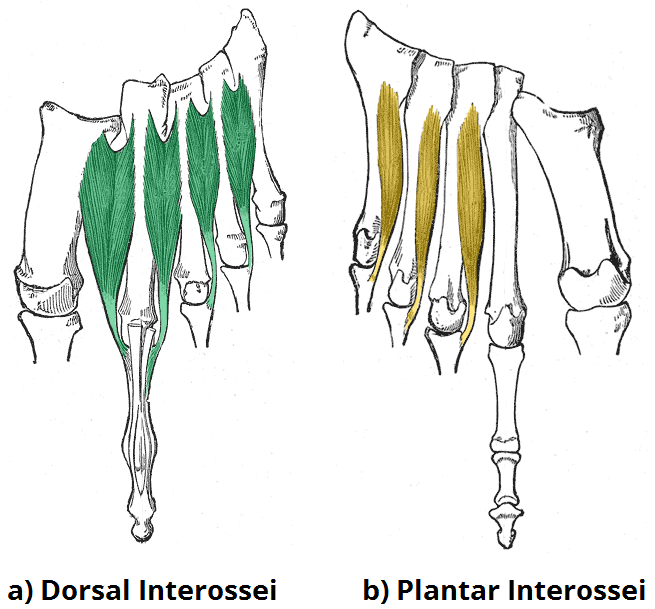 Which of the following correctly describes the shape of the plantar and dorsal interossei respectively?